I really wanted to get the Nifty Thrifty quilt top finished in March, but it just didn’t happen. Thursday evening everything except the outer border was completed, but I was too tired to continue. Those yellow blocks really pop out, don’t they? I wanted to lighten up the quilt, so I used light fabric for the inner border. 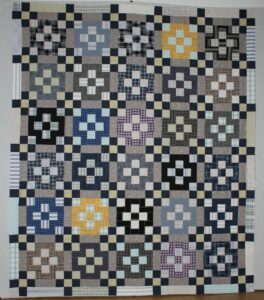 The outer border will be different lengths of all the gray & blue fabrics that was used in the blocks. The plan is to use as much of the shirt fabric as I can. This came out really nice. I love the pops of yellow.